Ever wonder why an airplane can stall with its engine running full speed? How airports developed into the convoluted mess that they have become? Who invented rudder pedals, ailerons, the fuselage, and the Mile High Club? It’s all here in Then & Now: How Airplanes Got This Way, Phil Scott’s rich, witty and fun seventh book. In this collection of hilarious, historical essays, veteran journalist and historian Scott takes apart aircraft through history and tells how, through a combination of science and art, all the pieces fit together to make a thing that worked—or didn’t. He explains how gasoline was used to cure the croup before it powered engines, how it was better to be thrown clear of a wreck than being strapped into the seat, how a future war hero invented instrument landings. In delightful Literary Intermissions, an aviator’s wife tells how her future lover wooed her with his training log, while a pioneering woman journalist learns how to take off and land. 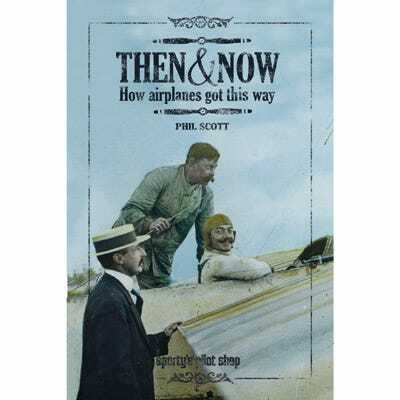 Scott’s exciting Then & Now explains not only how airplanes work in the air, but how pilots learned how to decipher these clues into a few movements of their hands and feet. Introduction by aviation legend Richard L. Collins. Phil Scott is the author of six previous books, including Hemingway’s Hurricane. The former managing editor of Flying and Omni, he has also contributed to Air & Space/Smithsonian, Scientific American, Maxim, New York, Men’s Health, Readers Digest, Portfolio and Boating, and he has logged time in 30 different types of aircraft. My husband is a private pilot and I can't wait until he wraps it at Christmas and starts reading it.